Last night my parents and I went to see Arabian Nights at Boscobel, an estate overlooking the Hudson River that plays host to an annual outdoor theatre festival. Before being summoned to the outdoor stage, it is tradition to have a barefoot picnic on the lawn. My usual picnic staples didn’t seem special enough for such a scenic evening, so I decided to try something completely new for me, Korean BBQ. Now, this may be a complete bastardization of the food category, but it’s delicious enough that I really don’t care. Tacos are a great picnic food, letting each person build to their preference while being much more special than a stack of sandwiches picked up at the local deli. While I recommend marinating the meat for at least an hour, I made the whole meal in 40 minutes so it’s definitely doable as a quick (but delicious) weeknight dinner. 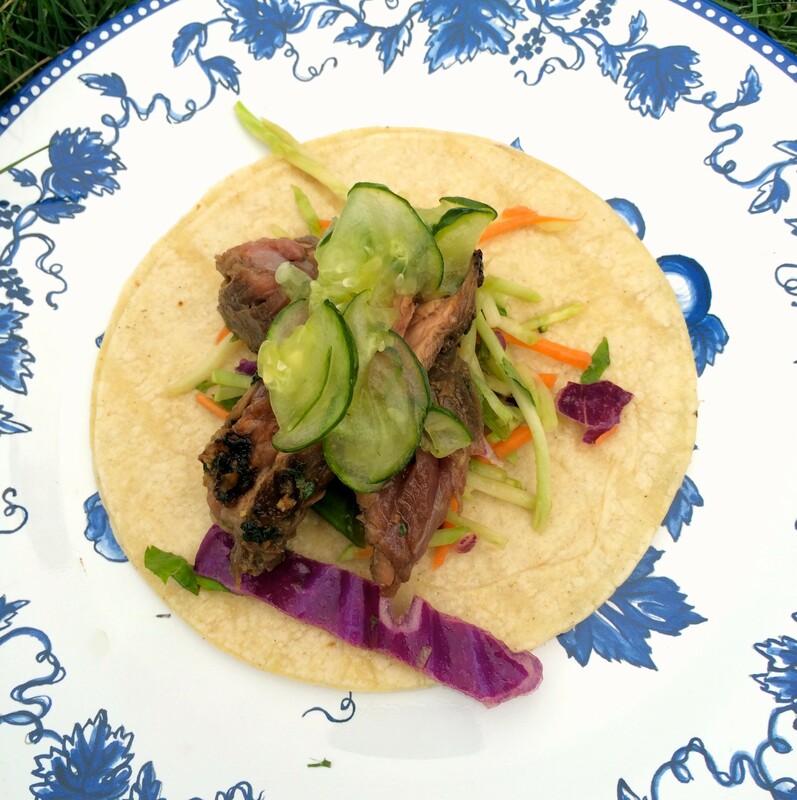 To assemble put a forkful of slaw on the center of a corn tortilla, add steak, and top with a few quick pickled cucumbers, and chow down. Serve along guacamole and corn chips (recipe included in prep below) and, of course, a good bottle of wine or chilled asian beers! Combine 1/3 cup cilantro, 1/8 cup brown sugar, 3 tbsp soy sauce, fish sauce, toasted sesame oil, crushed garlic, coriander, and canola oil in a plastic bag. Add meat and marinate for at least 1 hour (up to overnight), removing from the fridge 1 hr before cooking to come to room temperature. Cook at very high heat on the grill or in a large caste iron pan until cooked to your liking. Slice and set aside. Make quick pickle with the cucumber: Shave half of cucumber with a peeler or mandolin, combine with 1/2 tbsp salt and 1 tbsp sugar in a nonreactive container (a glass jar is best), and set aside. They will be ready to eat in 1 hour, but can be stored in the fridge for up to 1 week. Make slaw (base for tacos): Combine grated ginger, 1 tbsp soy, the juice of 1 lime, and 1 tbsp canola oil in a bowl. Toss in broccoli slaw and green onions until combined. Set aside. Mash avocado with juice of 3 limes and salt to taste. Set aside. Warm corn tortillas in a dry caste iron skillet and wrap in tinfoil. Pack up all components, throw a bag of corn chips, a bottle of wine, and a few forks in, and go on a picnic!